If you’re in the market for a slate, the $2,295 Sahara i440D is a good choice. It’s comfortable to use for long stretches, and we appreciate the versatility and responsiveness of the dual-mode display. It’s evident that TabletKiosk understands how Tableteers actually use these unique devices. The world is clearly moving towards touch screen interaction. Even though Microsoft’s tablet operating systems (XP and Vista) lack touch gestures, hardware manufacturers like tabletkiosk have forged ahead and provided touch capabilities. The touch capabilities at this point only provide mouse actions however the Sahara Slate PC should be able to handle any gestures programmed into the operating system. 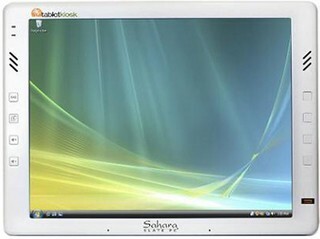 That being said the tabletkiosk Sahara Slate PC i440D is a very able Tablet PC computer. It performs very well against most 12.1” laptops and traditional (keyboard attached) Tablet PCs I have tested. The screen is bright and works well outdoors. tabletkiosk has done a good job of weight balance and it is very comfortable to hold with one hand. With WIFI and Bluetooth, the only missing networking option is Cellular Broadband, but that is easily remedied with a PCMCIA card. If you can live without an attached keyboard the tabletkiosk Sahara Slate PC i440D is definitely worth looking at. Visit the TabletKiosk Q&A Forum to get answers, ask a question or help others.